Asbestos mining in Newfoundland dates back to the 1890s, when two small-scale mines were established on the west coast, in the Bay of Islands and Port-au-Port areas. These operations experienced difficulty in transporting materials and equipment. Also, they were probably adversely affected by the French Treaty Shore issue - France disputed the legitimacy of industrial developments on the west coast, which created uncertainties for investors and entrepreneurs. By 1896, only a small quantity of ore had been exported, and the operations were abandoned. Courtesy of the Department of Natural Resources, St. John's, NL. Asbestos occurs as a fibrous, crystalline material that can be used to manufacture a variety of products. It is especially useful in making heat-resistant products such as brake pads. The major markets for the Baie Verte asbestos were in western Europe and South America. The mine employed up to 550 people. Over the course of the 1970s, it became apparent that mining and milling asbestos was hazardous to the health of the workers, as many of them were developing cancer, lung problems, and other serious illnesses. The union, a local of the United Steelworkers of America, pushed for action on the occupational health issue. In 1976, they succeeded in having Dr. Irving J. Selikoff, an world-renowned specialist, come to Baie Verte and examine 485 mine and mill workers (97% of the work force). His report, published in 1977, indicated that 10% of those examined had asbestos-related diseases. Others, whose exposure was prolonged and/or intense, would also soon develop various illnesses associated with their work over the years. The Selikoff report came at a time when the company and the union were in contract negotiations, and the union made it the centrepiece of their demands. The union insisted that the company and the government act to institute Dr. Selikoff's recommendations, which included: close and regular monitoring of asbestos dust fibres in the air; the establishment of lower, safer dust-level standards; establishment of practices and facilities to curtail exposure to dust (such as showers and carwashes); and strict control of the dust from the huge tailings pile adjacent to the mine site, which often blew over and settled on the town, the water supply, and the surrounding roads. The company was not prepared to meet these demands, and contract talks broke down. The company claimed that such health and safety measures were unnecessary, and would threaten the financial viability of the mine. Future premier A. Brian Peckford, who was then Minister of Mines, took a similar position, pointing out that pursuing a hard line on these issues jeopardized the operation. 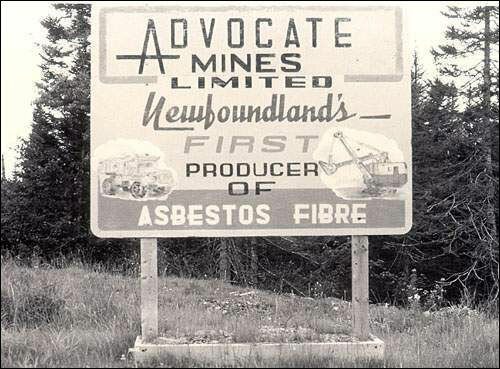 The sign reads "Advocate Mines Limited: Newfoundland's first producer of asbestos fibre." The union stood firm and when no deal was reached, the workers went on strike. The strike lasted 14 weeks, and was accompanied by mass demonstrations. Women in the area were particularly vocal. They organized and held marches and demonstrations backing the union's demands. Eventually, the company gave in to many of the demands, and some improvements were carried out in the areas of working and living conditions. The Baie Verte miners' strike was significant in a number of ways, not least because it was one of the first strikes in Canada fought almost solely on the issue of occupational health and safety. By 1980, however, the Baie Verte mine was facing another set of problems. Though the asbestos reserves were estimated to still be very extensive, the higher-grade material which was readily accessible in the open pit was in short supply. Also, markets declined as the general public became more aware of the health hazards associated with asbestos products, and alternative materials were put to use. The Advocate mine shut down in 1981. The board shows 0 hours since the last lost time accident. 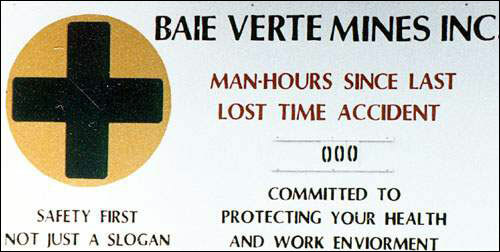 The asbestos mine at Baie Verte was reopened in 1982 by Transpacific Asbestos Limited, which ran the operation under the name of Baie Verte Mines Limited. By 1990, problems of markets and access, along with a wide range of health and legal problems, led once again to mine closure. 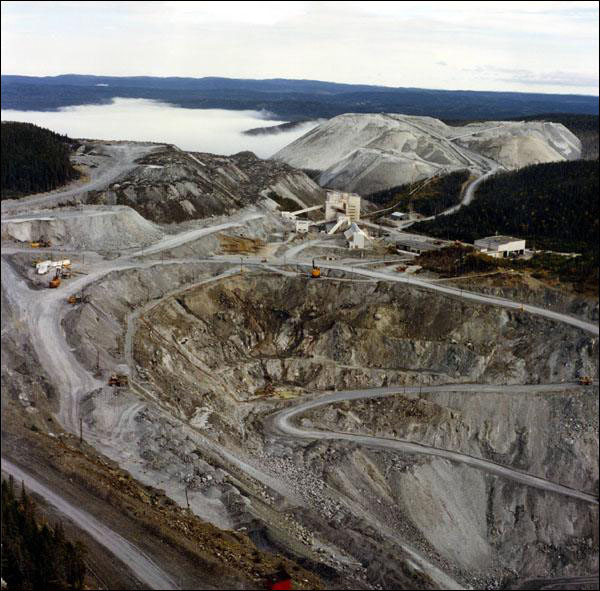 Image of "Advocate Asbestos Mine at Baie Verte" updated October, 2007.